Making my own cheese..wow,it even sounds interesting to me.The only homemade cheese I had ever come across before this was our very own Paneer/Cottage cheese.Somehow,I am not so keen on homemade Paneer mainly because,I cook it only once in a while since I am the only paneer lover here.It sounds much better to order in Paneer Butter Masala when I feel like having it!! So it is with great anxiety I set about making Mascarpone cheese at home.As you might know,many bloggers have tried making this with great success and Vera’s recipe is a foolproof one.I have seen Deeba and Ria and then the whole bunch of Daring Bakers try it during the Tiramisu challenge.I was excited and couldn’t wait to make my own version of homemade Mascarpone cheese! !Here's how I made it..
Bring 1 inch of water to a boil in a wide skillet. Reduce the heat to medium-low so the water is barely simmering. Pour the cream into a medium heat-resistant bowl, then place the bowl into the skillet. Heat the cream, stirring often, to 190 F.
Add the lemon juice and continue heating the mixture, stirring gently, until the cream curdles. Do not expect the same action as you see during ricotta cheese making. All that the whipping cream will do is become thicker, like a well-done crème anglaise. It will cover a back of your wooden spoon thickly. You will see just a few clear whey streaks when you stir. Remove the bowl from the water and let cool for about 20 minutes. Meanwhile, line a sieve with four layers of dampened cheesecloth and set it over a bowl. Transfer the mixture into the lined sieve. Do not squeeze the cheese in the cheesecloth or press on its surface (be patient, it will firm up after refrigeration time). wow divs, its come out perfect..thanks for the rcp..
Have been fantasizing about trying this out Divya... Tiramisu has to me made soon!! Wow u made mascarpone at home..Great work Divya.. I cant gather up the courage yet, to make mascarpone at home... Your step by step pics are lovely! 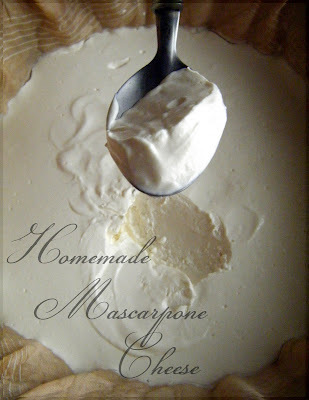 Love the new blog look, Divya.. wow mascarpone cheese sounds good.. I'm too lazy to make this when I can buy it in the stores here..but will try it out some time later before moving to India for good so that I don't miss my favorite tiramisu. I can see tiramisu coming up in this space soon.. haha :) Thanks for the step-by-step cheese making recipe. Mascarpone is expensive here. Good post! So tiramisu is coming...? Divya that's super ! so creamy and luscious it looks ! Bookmarking this for sure. Its a very informative post dear. Love how it has turned out. 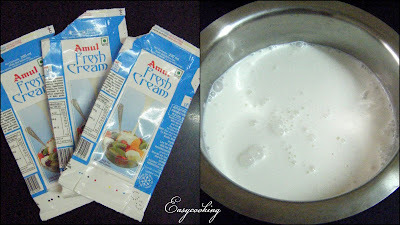 It makes fantastic frosting anf filling for the cake too and is divine with fruit cakes! Wow that looks so perfect! Excellent clicks! I love this cheese! I have made it over and over and over again!Thanks for the mention,Divya! This looks fantastic. Where did you buy your thermometer? What is cheesecloth ?? is it available easily ?? and what do i ask the vendor when i have to buy it. hello i want to make this but how will i come to know that cream has reached to190F temperature? please guide me for this. I do not have a thermometer to check the temperature as well.I add the lime juice when I see small bubbles start forming at the sides of the pan and it works fine for me. Yes you can use this cheese for cheesecakes as well!